Outlook is an email application that let users access their emails both on the desktop application and Web. The OWA (Outlook Web Access) makes users check their emails on Net. This ensures that if the Outlook application is not working then the user can check his/her mail on the browser. But with Lotus Notes it required extra permissions. The Administrator will set permission to access Notes on Web as iNotes. Lotus Notes email app can be accessed over the network as iNotes only if the administrator allows. This facilitates user to access lotus notes and check emails from home. So, if you need to send mail and the system is not available, you can type the address in the browser and send/ receive emails. First and the foremost step is to ask the Domino Administrator to make your NSF file available for web browsing if the organization permits. 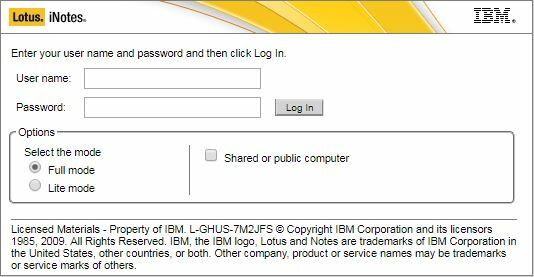 In this way you can easily access Lotus Notes account on web-browser. Lotus Notes is not same as Outlook as it can be accessed via Outlook.com only, Lotus notes have company web address and then it directs you to the user account. Use the steps and access your emails on the web.